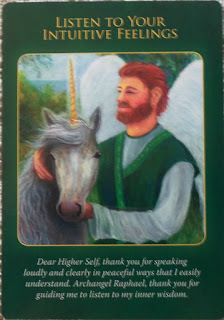 Card of the Day ~Listen to your Intuitive Feelings~ Your body is receiving accurate messages from the Divine. Your angels want you to know that you’re always receiving Divine messages, even when you’re not noticing them. Most of these messages come through your physical and emotional senses, as your body is extremely sensitive to subtle energies. Sometimes you may not understand your feelings, yet they always have accurate, underlying wisdom. You’ve received guidance to this card because you’ve asked a question that your body has already answered through your emotional and physical feelings. You’re urged to trust your feelings, and act upon them without delay. Ask the angels to protect and guide you, which they do through your intuitive sensations. As you give psychic readings or healings to others, know that it’s impossible to be blocked from receiving angelic guidance. You’re always feeling and thinking, and those are two primary ways in which the angels give you messages for your clients and yourself. Tell your clients what you’re feeling and thinking during your sessions, as these messages are meant to be shared. Now I would like to point out that this card isn’t just for psychic readings, it applies to all professions. Like banking, doctor, or the Super Store clerk that advises a customer to get a different brand then the brand of product they were originally going to buy. Use the feelings your body received because your body is receptive to energy just like a radar. Our bodies are made up of energy so it can feel the different frequency levels etc. Trust in yourself my dear friends. Have a fantastic day. I love you all!